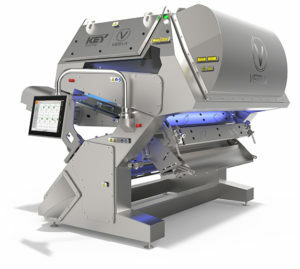 Key Technology VERYX® transforms digital sorting with a modular platform of chute-fed and belt-fed sorters to meet your unique and specific needs. With its innovative mechanical architecture and sensor technology, state-of-the-art electronic sort engine, advanced machine algorithms and rich information capabilities, VERYX delivers a revolution in the performance that defines the new standard for digital sorting. The Belt-Fed VERYX is the first sorter to deliver total product inspection that is sustained throughout the production cycle. Smart features such as auto-learning, self-adjustment algorithms, predictive system diagnostics, smart alarms, FMAlert™ and Sort-to-Grade™ enable VERYX to operate virtually unattended during normal production. VERYX can be configured for two-way or three-way sorting. With a highly innovative mechanical architecture, multi-sensor Pixel Fusion™, the highest resolution cameras and laser sensors available on a digital sorter and the most precise ejection system on the market, VERYX maximises foreign material (FM) and defect detection and removal while virtually eliminating false rejects, improving yield and ensuring quality.